Our quilt guild has a holiday party with a Yankee Swap. It used to be a real high-spirited swap where you were guaranteed to have an awesome gift stolen away. But the guild now has over 100 members so in the past several years it has been musical chairs with packages. You get what you get when the music stops. No more stealing something you see on the far side of the room! This year my package contained these 5 half yards of fabric. A creative, generous gift. One Alison Glass Handcrafted fabric, two grunge fabrics and one coordinating batik. Three of the colors are in my palette: the maroon way out of my comfort zone! What to do with them? This is clearly just a head start on a fabric collection for a quilt. These 4 half yards need to be augmented with more fabrics. So I went searching in my stash. 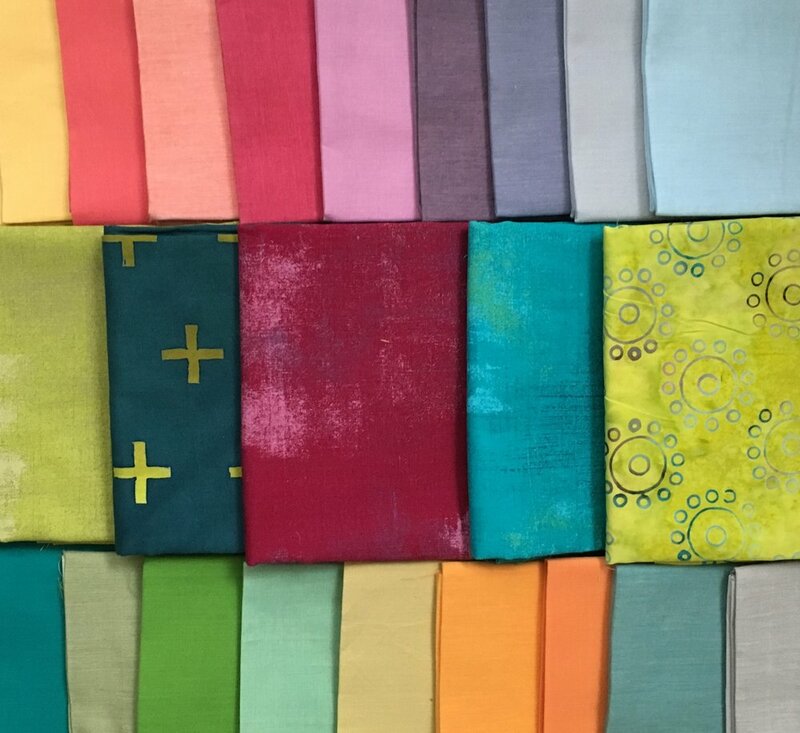 I found a whole stack of Kaffe Fassett Shot Cottons fat quarters that are a perfect complement to these feature fabrics. This looks like fun. So I'm off to my Electric Quilt 8 program to design a quilt. These fabrics are too special to be cut without a good plan!